Both moderate and extremist Islamic movements practice jihad with respect to their perspective and according to the political physics. Subsequently, every action must have a reaction. Reactions come as a result of those practices. We can say that the confronting violent jihad is the luckiest thing in governments' polices and other concerned parties. But, continuing focusing on violent jihad imposes questions about the relationship between Civilization and violent. It makes one asks which is better to fight at the first place? Or is it better to fight both of them at the same level? Unifying and directing Muslims' effort. Presenting Islam as a civilization alternative. The memorandum is one of the important documents that prove the concept of "Civilization jihad;" it may be the source of this concept. In fact, Mohammed Akram's attempt is just to spread in America; but it is the reflection of spreading this kind of jihad in various regions through whether establishing branches of Muslim Brotherhood in different countries, establishing Islamic unions without an effective control over their activities, establishing mosques led by Wahhabis, establishing and spreading Islamic sites" advocacy of extreme measures or views" that work on building an Islamic character that aims at establishing an Islamic state according to the ideas of the Islamic movement, or spreading the charity organizations that belong to hidden extremist Islamic organizations. Generally, Civilization jihad could be defined as "seeking to establish an Islamic state by working on building an Islamic fan base through intensifying advocacy, resettlement and empowerment of the Islamic Movement in the communities where the Islamic state shall be launched; it will renounce violence in its early stages." Violent jihad is the final phase of jihad according to the Islamic perspective; it is represented in fighting for establishing the Islamic state, upholding the word of God and acting according to His law and its provisions in accordance with the verse, "And whoever does not judge by what Allah has revealed - then it is those who are the disbelievers." 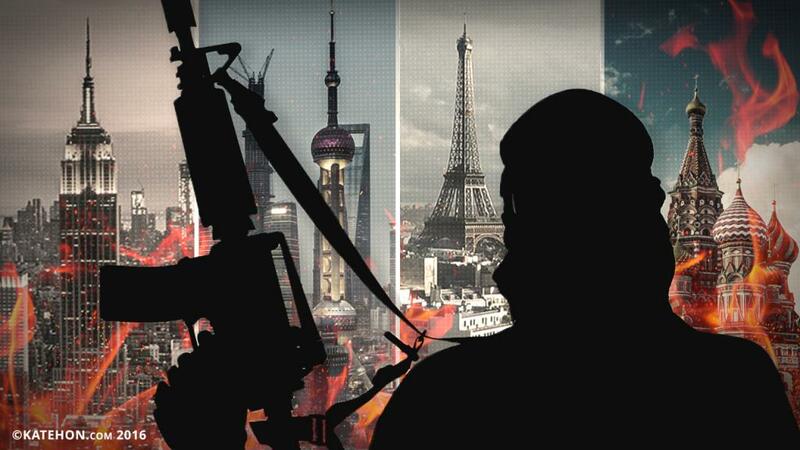 The continuation of violent jihad in spite of the ongoing confrontations of the jihadist organizations all over the world has several interpretations; one of the most important interpretations is to allow an area where the establishment and the spread of Civilization jihad can be achieved. The second kind "Civilization" works on planting the seeds of extremism in its followers; irrigating these seeds comes through the intervention of jihadist groups to recruit them so the extremist ideology grows and the individual turns directly toward the violent jihad. Both kinds have features and advantages; on one hand, it could be said about violent jihad that it is a direct confrontation against the governments and communities that reject representing the Islamic law and the establishment of an Islamic state governs according to divine Shariah through describing Islam as the Savior of mankind, thus it saves the mankind from Al-Jahiliyyah, ignorance of divine guidance, without establishing a fan base that serves these goals. On the other hand, Civilization jihad is the most rational, sensible, and accurate kind concerning developing strategies; it serves as the infrastructure and cornerstone of constructing an Islamic state based on the application of law and resorting to Islam as it is against the prevalent ignorance in the communities according to the perspective of thinkers of such groups and through building and developing a fan base that has values ​​and ideas of establishing an Islamic state. If we want to shed light on models of violent and Civilization jihads, we can see a live model through the "Organization of the Islamic State in Iraq and the Levant". It is a great model for the first kind, violent jihad. As for the second kind, Civilization jihad, the most obvious and effective model is the international organization of Muslim Brotherhood and its various branches and establishments all over the world. Also, there are many other organizations that adopt both models. We can say that "al-Qaeda organization" throughout different stages of its history combined between the two kinds, violent and Civilization jihads. The gravity of violent jihad can't be not compared to the seriousness of the "Civilization jihad" despite of the consequent results and losses of violent jihad; it could be said that "Civilization jihad" is the most dangerous, but it is the foundation of violent jihad as it is considered as a preparatory stage for a successful violent jihad. It is very dangerous because the followers of "Civilization jihad" work form the early beginning to instill the idea of ​​the need for applying the Islamic law and the provisions of Islam; these provisions are covered with tolerant speech where Muslims show themselves as oppressed and persecuted, they should receive their rights in the framework of respecting human rights and international conventions; they show other mechanisms that allow building a community based on the attitudes of the Islamic group. It could be converted into an army of extremists; we don't mean all other Islamic groups in different countries, but we mean those groups who adopt extremist attitudes and thoughts. On the other hand, numbers show that the followers of Civilization jihad groups double the numbers of those who belong to jihadist groups who adopt violent jihad. The number of the followers of Muslim Brotherhood all over the world is 100,000000 individuals according to the statistics of 2013, but the number of those who belong to Daesh is 200,000 fighters as largest organization that represents violent jihad. How to confront both kinds of jihad? Confronting violent jihad is much easier than Civilization jihad, as the latter pushes the countries towards falling under the human rights violations and persecution of Muslims, so it shows the concerned state as if it infringes human rights and it is in a state of hostility against Islam and Muslims, that increases the likelihood of exposure that State to attacks by the followers and sponsors of "violent jihad." In order to avoid the speed of Civilization jihad, concerned states should work on fighting violent jihad through participating in the armed operation that target the strongholds of violent jihad provided that not injuring any civilians living in these sites along with tightening supervision that doesn't restrict the activities of Civilization jihad's followers whether through amending the laws that govern their existence and work like the laws of naturalization by birth and the materials of the sermon provided in mosques that feed the formation of extremists, or the laws of the NGOs affiliated to them and activating control over them. countries that suffer from the risk of the spread of violent jihad should depend on activate Islamic Da'wah Centers that illustrate the fact of the Islamic law concept and how to apply it and the validity of time and current conditions that the reality imposed.